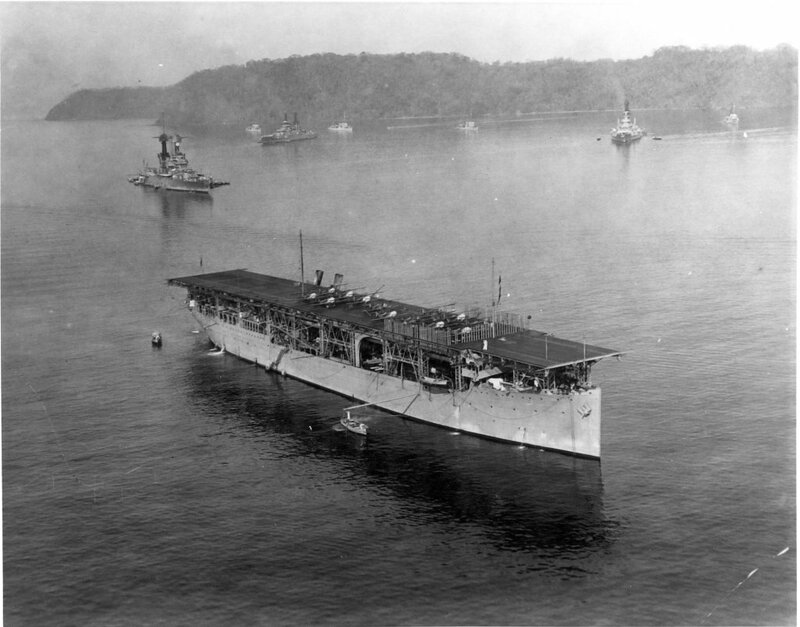 20 March 1922: USS Langley (CV-1) was commissioned as the first aircraft carrier of the United States Navy. It was a former collier, USS Jupiter (AC-3), which had been converted at the Norfolk Navy Yard, 1921–1922. USS Langley was 542 feet (165.2 meters) long, with a beam of 65 feet, 5 inches (19.94 meters) and draft of 24 feet (7.32 meters). Her full load displacement was 14,100 tons (12,791 metric tons). The aircraft carrier was powered by General Electric turbo-electric drive, with a total of 7,200 shaft horsepower. Steam turbines drove generators which supplied power for electric motors which drove the propeller shafts. She could make 15.5 knots (28.7 kilometers per hour). The ship’s complement was 468 officers and men. Defensive armament consisted of four 5-inch/51-caliber (127 millimeters × 6.477 meters) guns. These guns, firing a 50 pound (22.7 kilogram) projectile, had a maximum range of 15,850 yards (14,493 meters). Lieutenant Commander Virgil Childers (“Squash”) Griffin, Jr., United States Navy, made the first takeoff from an aircraft carrier of the U. S. Navy when he flew a Chance Vought Corporation VE-7SF fighter from the deck of USS Langley (CV-1), 17 October 1922, while the ship was anchored in the York River along the west side of Chesapeake Bay, Maryland. As more modern aircraft carriers Lexington and Saratoga came in to service, Langley was once again converted, this time to a sea plane tender, AV-3. 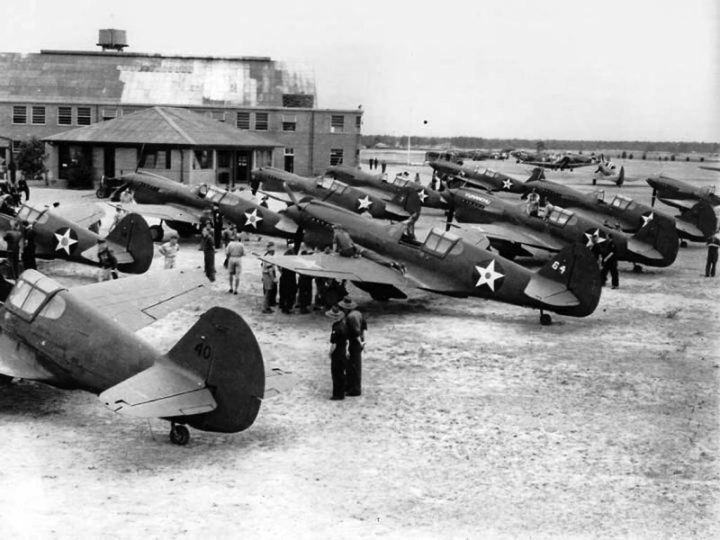 Langley, under the command of Commander Robert P.McConnell, USN, delivered a cargo of thirty-two Curtiss P-40E Warhawks for the 13th Pursuit Squadron (Provisional) from Fremantle, Western Australia, to Tjilatjap Harbor, on the southern coast of Java, Dutch East Indies. After leaving the harbor on 27 February 1942, Langley was attacked by a group of Imperial Japanese Navy Mitsubishi G4M “Betty” twin-engine medium bombers. After evading several bomb runs, Langley was hit by six bombs. 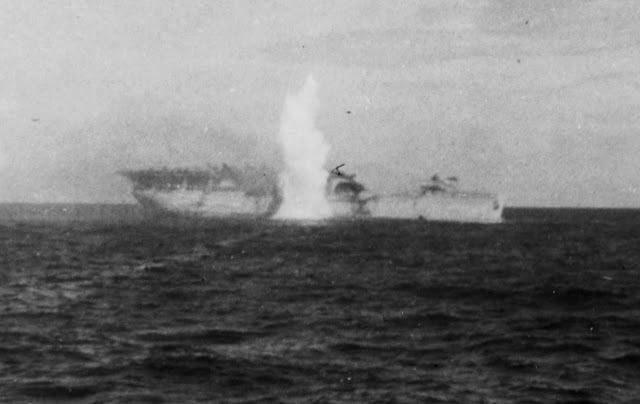 On fire and with its engine room flooded, the crew was forced to abandon ship. 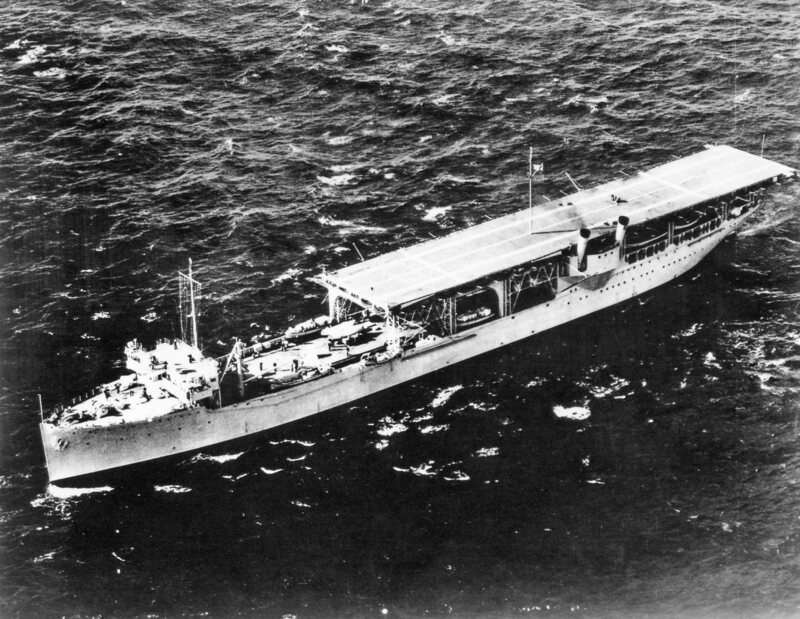 Langley was torpedoed by an escorting destroyer, USS Whipple (DD-217), to prevent capture. The crew of Langley were taken aboard a fleet oiler, USS Pecos (AO-6), and thirty-three Air Corps pilots were transferred USS Edsall (DD-219). Pecos was sunk while enroute to Australia, with the loss of many lives. Edsall was also sunk and thirty-one of the Army pilots died. More aircraft carriers would follow and were the key to the United States Navy victory in the Pacific Ocean, bringing World War II to a close. 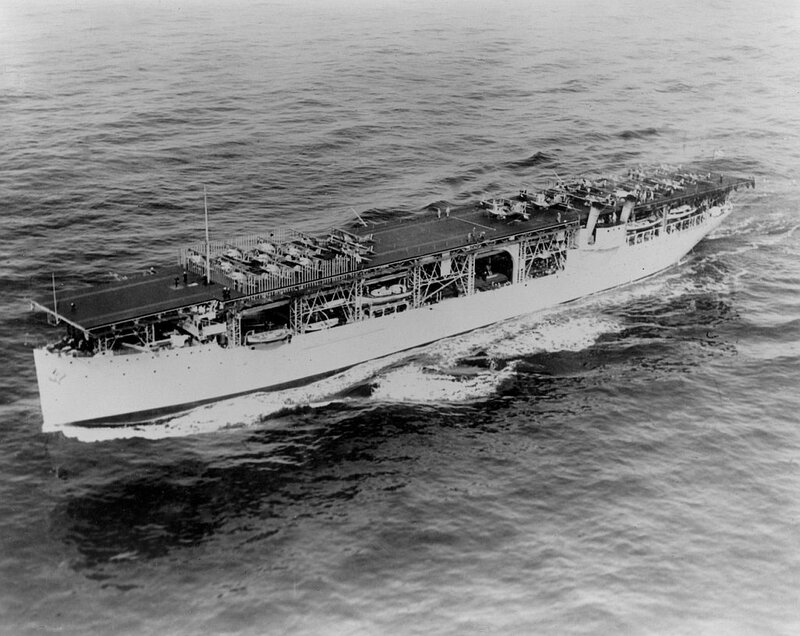 Ninety-seven years after USS Langley was commissioned, the aircraft carrier is the center of the American fleet. 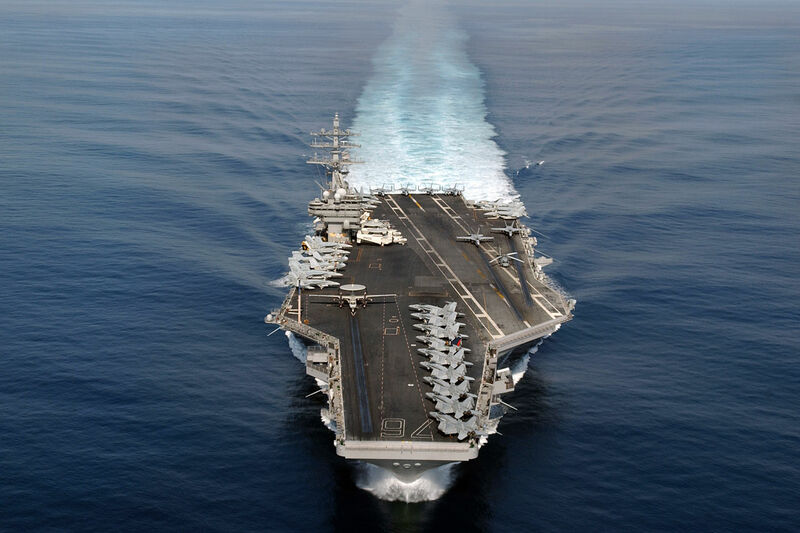 The Nimitz-class carriers are the most powerful warships ever built. 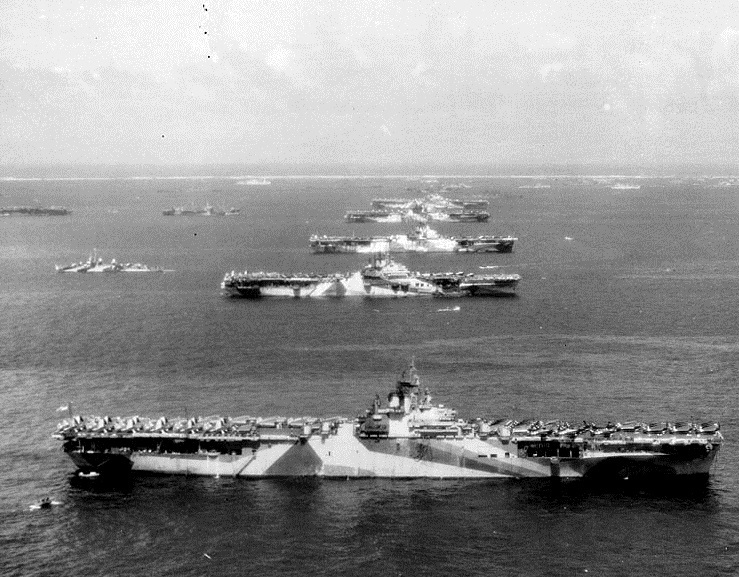 Look at the carriers all lined up in a straight line in 1944! They didn’t learn their lesson at Pearl Harbor. By 1945, more than 700 ships were at Ulithi. 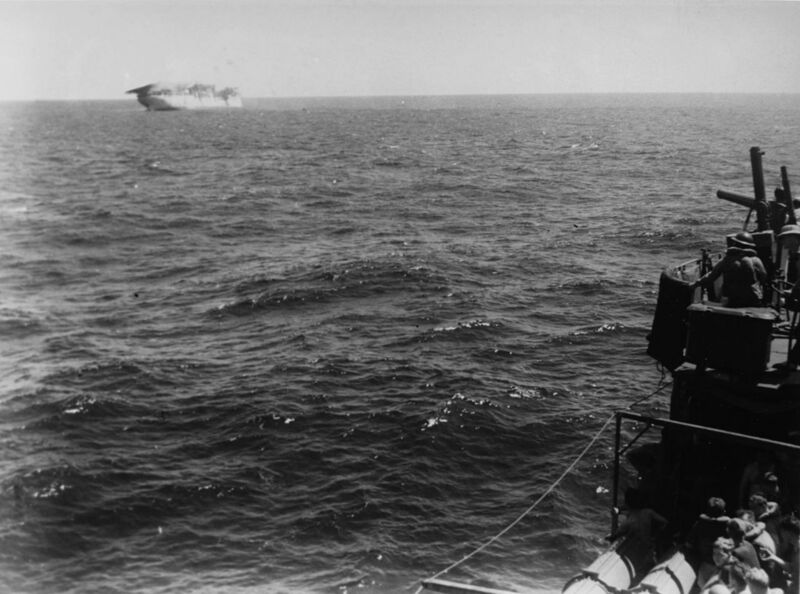 Although there were some midget submarine and aircraft attacks, very few ships were hit. Lining up the carriers side-to-side instead of end-to-end as was done as Pearl Harbor’s battleship row would make only the end carriers vulnerable to air dropped torpedoes.